Andy Rubin, the man who oversaw the development of Android How Many People Use Android? And 4 Other Facts You Didn't Know How Many People Use Android? And 4 Other Facts You Didn't Know There's more to Android than you might think. Here are some interesting facts that might surprise you. Read More , has a new product to show off. It’s a smartphone, it runs on Android (naturally), and it’s set to cost $699. Beyond that, details are sketchy, because right now the Essential Phone is nothing but a collection of specs and renders. Rubin has been teasing a new product for some time now. Today, after much speculation from the tech press, Essential revealed the Essential Phone. The Verge got the exclusive, which essentially reads like a press release. And everyone else was then directed to the Essential website. The Essential Phone is a top of the range Android handset priced at $699. For that money you get a 5.71-inch QHD display, a Qualcomm Snapdragon 835 processor, 4GB of RAM, 128GB of storage, a 3,040 mAh battery, a 13MP rear-facing camera, and an 8MP front-facing camera capable of shooting 4K video. The placement of the front-facing camera means the screen has an ugly chunk missing out of it. Which is rightly being ridiculed. And, following Apple’s example No Stereo Jack, No Problem: Why the iPhone 7 Sounds Great No Stereo Jack, No Problem: Why the iPhone 7 Sounds Great It's official -- Apple has removed the standard 3.5mm headphone jack on the iPhone 7. But don't worry, this is a good thing. Read More , there’s no 3.5mm headphone jack either. Which makes a mockery of the Essential name given that most people still use wired headphones. The innovation comes in the form of two pins on the back into which you can plug a variety of accessories. This includes a 360-degree camera. There’s also a charging dock, and the body made from a combination of titanium and ceramic. You can pre-order the Essential Phone today, but there’s no word yet on when it will actually start shipping. Android is by far the most popular mobile operating system in the world Android Now Powers 9 Out of 10 Smartphones Android Now Powers 9 Out of 10 Smartphones The mobile operating system war is now over. And Android won. Because while Apple still sells shedloads of iPhones, 9 of 10 smartphones sold around the world is now powered by Android. Read More , and Rubin was heavily involved in its development. Which means he has some serious clout in Silicon Valley and beyond. And that’s the only reason anyone is interested in the Essential Phone at this extremely early stage. 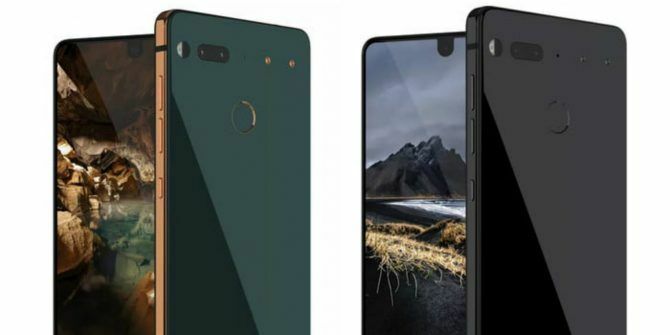 On paper the Essential Phone looks like it will be a decent Android handset with some innovative touches. Nothing more, nothing less. The problem is that the Essential Phone doesn’t actually exist in the real world yet, and until reviewers get their hands on it, we won’t actually know how good it is. What do you think of the Essential Phone on paper? Are you likely to pre-order it based on nothing but specs and renders? Do you like the design? Are you annoyed at the lack of a 3.5mm headphone jack? Please let us know your honest opinions in the comments below! Explore more about: Android, Google. Good luck with that phone for Mr. Rubin . . . He will need it. No, no thank you I believe it is over priced and Android means Google and all the forced apps I never use, and even though I have Bluetooth head phones I still need to use wired earphones occasionally. And no mention of an SD card. I just want a phone with a removable battery and SD card support. I appreciate having extra ports a lot more than I care about the aesthetics of glass backs or mild degrees of water resistance. I also think an "essential" phone shouldn't cost $700.